When I pull back my window drapes, I discover half of Delhi has disappeared. It’s my first day in the city and a new bed in a strange room has me rising early. From the tenth floor, I see the horizon has dissolved in a cloud of heavy fog as a cold snap grips India’s capital. Still, people are up and about and the monkeys are undeterred – an entire family are on an outing on the roof of a nearby temple. The sun has scattered some of the fog when, with our stomachs humming happily after a meal of hot golden brown stuffed aluparathas and pickle, we head out armed with a list of what locals tell us are the must-see sites. The Qutb Complex: Our first stop is this UNESCO World Heritage site, the home of one of Delhi’s most incredible monuments. It is also one of the few sites where the Archaeological Survey of India offers an audio guide (100 INR). I pick it up to hear the childish voice of ‘Maya’ from a ‘nearby village’ who promises not only to show me around but also play peacemaker among kings. Joining her on the tape are the squabbling emperors – beginning with Qutb-ud-Din Aibak who built the base in 1193, each worked successively on the Qutb Minar. They all have a legacy to impress upon their listeners and something nasty to say about their competitors. The audio guide is a success – even though I tune it out as I look up at the Qutb for the first time. It is so beautiful– larger than I expected, yet incredibly graceful in its steep taper to a height of over 70 feet. It is broken up in to segments, each marked by an alternating stone frill of round and pointed flutings.The tower is built with red and cream sandstone, the source of which is immediately apparent in the beautiful temple ruins that surround it. Carved into the very rock are sayings from the Quran, rendered in exquisite calligraphy. Also in the same complex is the small yet lovely tomb of Iltutmish (1235 AD) with stairs leading down to a crypt. The walls again are festooned with intricate carvings on which parrots perch, taking a break from busy flying. The Lotus Temple: Next, for this is to be a day of determined sightseeing, we go to the Lotus Temple, where long queues welcome us. Among the glorious Mughal ruins of Delhi, the Bahá’í House of Worship is an alien – a creature of decided modernity. Twenty seven free-standing marble clad ‘petals’arranged in clusters of three form the nine sides of the ‘lotus.’ Coming through the geometric gardens, you climb a flight of stairs to discover blue pools of water and white marble. Inside the temple it is absolutely quiet. The raucous crowds from outside fall silent. I sit down and gaze up to where a latticed bronze star lets in a flood of light. Open to all regardless of religion, the Lotus Temple reportedly has more visitors than the Taj Mahal and the Eiffel Tower. Judging by those queues, I believe it. Hours have flown by before we stop for a platter of luscious kebabs grilled in a tandoori oven and served with naan (and fried rice because my mother decides she’d like Chinese). Discovering shops on the way back, we lose ourselves in a little friendly haggling from which we emerge triumphant, carrying clothes and bronze statues. Delhi is a crazed shopper’s paradise – brimming with beautiful things but we have much left to accomplish, but more on that in part 2. 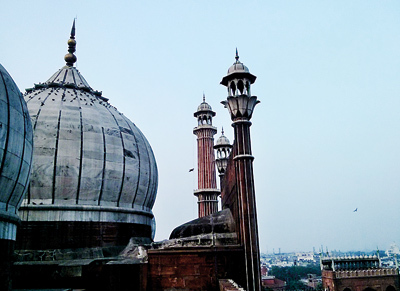 The Jama Masjid, India’s largest mosque, is waiting. The Jama Masjid: To get there is to brave the worst of Delhi’s traffic. Turning off the main road, the lane leading up the imposing gate of the mosque is a mess of traffic. People pour into it from every direction, a constant assault made up of men pulling carts by hand, peddling rickshaws and smaller three-wheelers nudging through a space shared by cyclists, bikers, cars, buses and pedestrian traffic risking life and limb for every square metre of progress. Finally, climbing the stairs of the Masjid we arrive at the entrance. I have a shawl ready to drape over my head and am dressed in a salwar kameez. Those less respectfully clad are given little housecoats which tie at throat or in the case of men, lungis they can use to cover up. They still end up flashing bare legs in shorts. There’s plenty of space, for foreigners and locals alike. Three black and white domes frame the central arch that looks over a grand courtyard that can hold thousands of the faithful. I am drawn to the minarets but at first, the men at the ticket counter will not permit me to enter when I confirm I have no man to accompany me. This is irritating but when I produce my mother, we’re allowed up. A flight of steps leads us to the rooftop from where you can make your way to the tower proper. The way to the top is steep and curving, the sheer stairs carved into a tunnel of rock. Somewhere around the 500th stair, I am feeling winded and intensely claustrophobic. Tracking the little windows of light and trying to protect myself from the stream of people pushing their way down past me, I’m fantasising about turning around myself. When I finally reach the top, 40m up, I’m dismayed to find it crowded. The stairs arrive through a hole in the floor. The tower is encased in a grill and its standing room only as people cling to the metal. I convince some children to make room for me so I too can look out to where the grand walls of the Red Fort stand opposite. It is our next destination – we’re hoping to end our day with a sound and light show. The Red Fort: The 17th century fort was constructed by Shah Jahan and served as the capital for the Mughals till 1857, when Bahadur Shah Zafar lost it to the British. I have a real fondness for the last Mughal emperor – one of the finest Urdu poets of all time, he found himself the commander-in-chief of the Indian rebellion of 1857. He would be exiled to Rangoon, but not before the British presented him with the heads of his own sons as Nowruz gifts. Wading through the traffic again we make our way to the imposing gate of the fort –familiar as the backdrop to every Prime Ministerial Independence Day speech since 1947. The long moat is empty, the Yamuna having meandered away a long time ago. For 80 INR we are given access and admittance to the show. The fort is huge and calls for at least two hours of dedicated walking around. (The 9th century Persian poet Ferdowsi’s words are interlinked with this place: ‘Agar Firdaus Bar Rooe Zaminast Haminasto Haminasto Haminast’ (‘If there be a paradise on the earth, it is this, it is this, it is this.’). 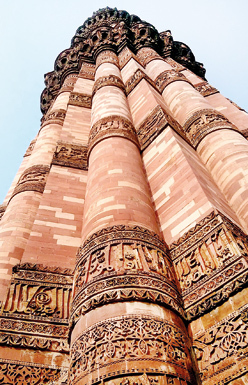 Here stone has lasted the wear of decades, delicate as lace in the latticed windows, inspiring awe as it soars overhead in the many pillared Diwan-i-Aam or Hall of Public Audiences. One word of advice, don’t linger for the sound and light show. We did and it was a disappointment. Sitting in the parking lot, waiting for our driver, I can’t decide which aches more – my feet or the small of my back. A crescent moon and a single star hangs over the Fort, and the main road is still a mad jumble of traffic. Closing my eyes for a moment in the taxi, I’m asleep before we reach our beds. For Part 2. look here. Published in The Sunday Times, Sri Lanka on 24 November, 2013. Words and Pix by Smriti Daniel.